After two apartments that I only half decorated I’m stoked to style our house completely from scratch. When it comes to decorating a home for two it’s important that we’re on the same page and agreed on the style we’re working towards. Luckily, John knows how much I love doing this as a designer so he’s handed over the control of the colors. 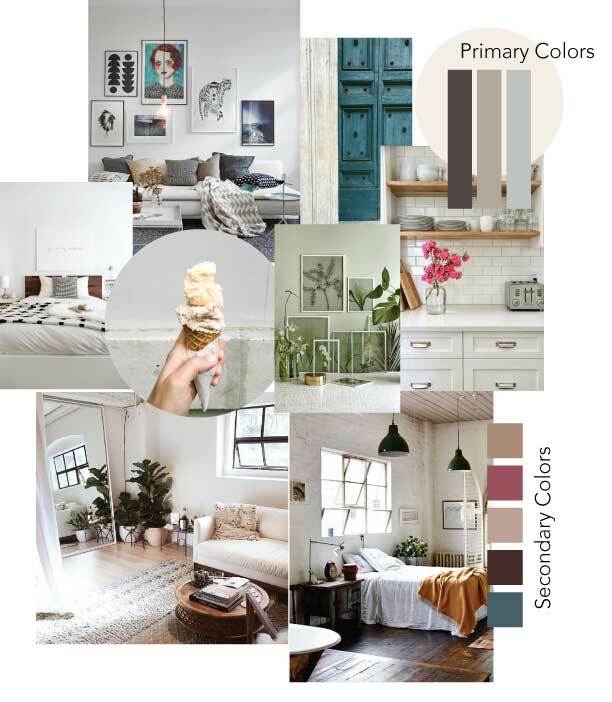 To keep our decor purchases on track I gathered our home inspiration and created a moodboard as well as color palette to use when we’re out buying things for the house. Or online. We buy LOTS of things online. Thank you Amazon Prime! Here’s the moodboard that we’re using to inspire our choices. There’s a few more images we’re using also with a little more structure/geometry. Leaning towards a modern minimalist style with hints of respect to the 1920s origin of the house. Textured whites with an overall neutral tone with subtle color, lots of natural wood elements and geometric accents here and there. Basically, I’m hoping to style it a little Kinfolk-y. The Primary colors are what we’ll use for the majority of the large pieces. Mostly white of course but with hints of the others. Then the secondary colors will influence very very small aspects of items.